Prisoner of the Truck is about the inner strength of a man who loves life, who overcomes childhood adversity and at age 75, embarks on a national mission to motivate students to be the best they can be. The Author, Fred W. Sarkis was born in Rochester, NY in 1926. He is the second of ten brothers and sisters. From age 8 to 14, after school, he became the "Prisoner of the Truck". At age 16 he graduated from a business high school, first in his class. He purchased a home for his family before he entered the US Navy in WWII, at age 18. At age 20, he worked full time while attending the University of Rochester at night. He started a business at age 24. He merged his national award-winning company with a major national firm and became a multimillionaire at age 34. He became the financial father of a ski area and founder of a major resort community. He has received many awards for community service. He is a proud husband, father of 5 children and grandfather to 11. Prisoner of the Truck is a true story about character and the self-discipline of a 12-year old boy who turned his 100-hour a week boyhood truck-prison into a study center. Fred Sarkis bought his mother and eight brothers and sisters a six-bedroom home at age 17. He became a multi- millionaire at age 34, built a ski resort, golf course, marina and condominium community and failed at age 50. He embraced adversity, and with lessons learned on the prison-truck, turned failure into success. 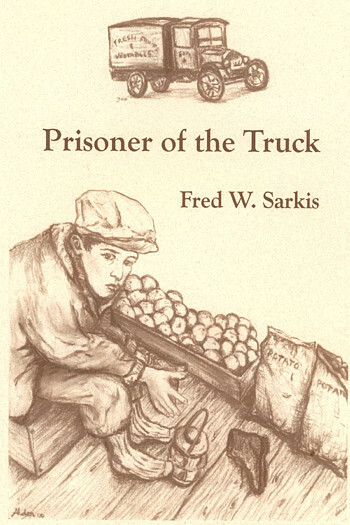 Prisoner of the Truck by Fred W. Sarkis is 347 pages and available in both electronic download and 6x9 paperback. You can order Prisoner of the Truck by following this link to Authorhouse™. Royalties go to the Yes Pa Foundation to maintain this site and to administer and provide free Yes Pa materials. By J.R. Smith — What gives meaning to a man's life? Is it an unquenchable determination to succeed, the pursuit of honesty in relationships with others, an abiding faith that goodness will prevail, a belief that a spiritual resource is ever present, an attitude of enthusiasm that meets the challenge of each day, the ability to recover from personal crises, the development of one's introspective nature, or is it the inner motivation that urges a person to continue to create new goals to achieve? In his autobiography, Prisoner of the Truck, the author, an American of Lebanese ancestry and a self-described "skinny, bow-legged, knock-kneed, pigeon-toed, dark-skinned boy who was mocked by his classmates" reflects on those shaping forces in his life which have carried him from his youth to his current aspirations at age 74. Deeply grounded in Roman Catholicism as a young boy, his faith supports him through the many trials which confront him on his way through school, military service, business, parenting, and retirement. Much of his success as well as his personal turmoil derives from his relationship with his father, his "incarceration" as a prisoner of his father's vegetable truck, and the lessons he learned from this experience. A successful businessman several times over, the author details his struggles to achieve self esteem in his boyhood, to attain financial success as a young man, to recover from his devastating losses in business, to understand the complexities of human afflictions, and his desire to share his wisdom with all who may be captivated by his spirit. Each episode in his life journey is crafted with insight and humor, reflecting the author's perceptions of how human relationships guided him in positive ways. Throughout the book the reader will find innumerable life lessons to be applied, and all conveyed with an openness and frankness revealing compassion and conviction of a man tested by the depths and heights of human emotions. The author shows that hard work and inventiveness, the persistent pursuit of a dream, the reliance on moral integrity, and the expression of caring can be fulfilling and a way of finding meaning in one's life. This is a book that will inspire you with its message as it reveals the inner strength of a man who loves life, who confronts adversity, and who demonstrates how to be of service to mankind. J. R. Smith is a Professor Emeritus, Earlham College, Richmond, Indiana. He was an educator for 38 years — a secondary school English teacher, a Coordinator of Humanities, a Director of Demonstration School and then a College Professor. He taught at Abington High School, Abington, PA 10 years, and at Earlham College for 24 years. He majored in English and French Wabash College, Crawfordsville, IN, and followed that with graduate studies at Harvard University, the University of Pennsylvania, a fellowship at Yale University, and the University of Massachusetts. It was 1937. Her gentle hand touched my 11-year-old shoulder. "Get up, its 4 o'clock," my mother whispered. I had to be quiet. There were six brothers and sisters still sleeping in two of the three small bedrooms on an upper flat in the inner city of Rochester, New York. Betty was 13, brother Joe was 8, Ann 6, Jim 4, Vicky 2 and my mother was pregnant, as it seemed she was throughout most of my boyhood memory. These were sad times for my mother. My father had lost his confectionery store on Main Street in Rochester, NY in 1929, the start of the great depression. He became a "huckster," starting with a horse and wagon in 1929 when I was three years old. He would rise at 4 AM, arrive at the public market at 5 AM, buy fruits and vegetables from farmers and sell them to regular customers in middle class neighborhoods that he established on the east and west side of Rochester. He would call on his regular customers every other day — the east side on Tuesdays, Thursdays and Saturdays and the west side on Mondays, Wednesdays and Fridays. If he lost a customer, he would knock on doors until he found a replacement. His eight-year financial struggle as a huckster from 1929 to 1937 failed to save the home on 470 Driving Park Avenue in Rochester. Like so many others in the depression years, he was forced to surrender a spacious four-bedroom home in this attractive middle class neighborhood. The house furniture, purchased on an installment plan, was taken away for non-payment. A cousin, also named Fred Sarkis, helped us to move the remaining furniture to Ormond Street. Our new home was cramped — about half the size of Driving Park Avenue. The furnished flat included three beds and mattresses. The flat was dirty and roach-infested. Bed bugs occupied the bedroom mattresses. My mother declared war on dirt, roaches and bed bugs. A powder was used for the roaches. The bed bugs were removed with a sticky mixture of flour and water. Several hand pads were made of this mixture. Under my mother's direction, the older children would surround the mattress, front, back and sides. We would apply the sticky mixture to visible pockets of the bed bugs. They would be trapped and would wiggle themselves to death. This was done periodically, and with the regular washing of bed sheets, bed bug bites became infrequent, if at all. A fresh coat of paint on the walls and woodwork made our flat into a comfortable small home. My mother kept the flat spotlessly clean. She would have it no other way. It took fifteen minutes to drive to the public market opening at 5 AM. Ford had invented the Ford truck as well as the Model T automobile. My father had sold his horse and wagon and bought a used Ford truck. There was an enclosed cab section that held two adults and a small open back section not much larger than a wagon pulled by a horse. In the cold season, this back section was enclosed. It was about five feet high. My father had to stoop when he entered it. A kerosene lamp was used to prevent the fruits and vegetables from freezing. The cab section had no heater. There were cracks in the wooden floorboards. From the light of the street lamps, I could see the ice and snow on the plowed and bumpy roads through the cracks in the boards. Shivers went through my cold skinny body. I wiggled my toes to keep them from freezing. I glanced at my father, big and strong, oblivious to the cold that enveloped me. He broke the cold silence with, "Did you wear your long underwear?" I wanted to say that I forgot, hoping that he would turn back, feeling some sorrow for my thin and tiny body and let me return to the warmth and security of my bed and home. I said, "Yes, ma made sure." When we arrived at the public market, I went to the enclosed back of the truck. I huddled next to the kerosene lantern to get warm. I took off my shoes and pressed my socks to the warm glass of the lantern. My fingers and toes were numb, frostbitten from the frigid drive to the market. As I sat in the cold isolation of the truck waiting for my father to complete his task, I thought about earlier times, when being with my father was an adventure. But this earlier childhood memory of a summer adventure had turned into a frigid winter nightmare. I wanted to be free to play with my neighborhood friends. I wanted to be like the kids I saw on my father's route. As much as I dreaded these winter Saturdays during the school year, eventually it became a summer nightmare as well. I feared the summer school vacation when I would have to be on the truck from 5 AM to 9 PM, Monday through Friday and on Saturdays as late as 11:00 PM, close to 100 hours a week. This was my third year on the truck. I was a very unhappy child. On this bitter-cold Saturday, as well as every Saturday during the school season, I was confined to this small-enclosed truck. I began to identify myself with schoolbook photographs of young boys who were prisoners of the coal mines. I was aware of child labor laws that stopped this practice. I wondered why my father was exempt from such laws. At 5:00 AM the public market was already busy. The farmers were the first to arrive to present their produce to the hucksters and restaurant operators who were arriving about the same time. Around 7 AM, the general public would arrive for direct purchases from the farmers. Outdoor covered sheds provided shelter for trucks to back into stalls on each side of a mid-section. The mid-section was used by the farmers to display produce for sale. Buyers would walk in this mid-section to inspect and buy their produce. Farmers were under sheds in one section of the public market and hucksters were in another separated section. Stall numbers identified the location of the farmers and hucksters. Each huckster wore a large purse with a strap that hung over his shoulder. One compartment was for bills and the other for coins. Hucksters used the purse to pay cash to the farmers as well as to collect cash from customers. Our market stall number was 103B. There were about 40 other hucksters in this section of the market. In the summer months, when I worked six days a week, my father was the last huckster to leave the market. He took more time to buy the best quality he could find. He also was able to negotiate lower prices from farmers who would otherwise return the fresh produce to their farms. In warm weather, when the back section was uncovered, unlike many hucksters, my father spent a considerable amount of time arranging his truck for the best presentation of his fruits and vegetables that were freshly purchased. By using empty orange crates and boxes of different sizes for support, he would create an attractive, colorful and angled display of his produce that faced the homemaker when he brought them from their front doors to the curb site in front of their homes. When the truck was enclosed in the winter, many of the customers put on their winter clothing and entered the back of the truck. An aisle was left in the middle of the truck. In a cramped setting, customers could select their fruits and vegetables on either side of the aisle. Year round, a scale hung from the truck's interior. My father's customers were primarily of German, Scottish and Irish heritage. They liked the quality of produce presented to them. More than that they liked him. They were willing to pay a higher price for the quality and his personal door-to-door service. Year round, most of the hucksters worked alone. A few had adult helpers that assisted them in the summer months. If a huckster worked alone, he would either deliver the produce to his own stall or have the farmer's helper deliver them. Most hucksters were ready for business and left the public market at 8:00 AM. My father was an exception. The entire process of buying, trimming, displaying and selling started at 5:00 AM when we arrived at the market until 8:30 AM when the truck was prepared for calling on customers. Before we called on the first customer, my father would spend about an hour in the public market restaurant "having coffee" while I waited in the truck. Often, we would not get to our first customer until 9:30 AM. On the winter Saturdays, when we arrived at Hedges Bar & Grill around 7 PM, I was locked in the back of the truck. I had two empty glass quart bottles — one to drink out of an one to urinate in. My dinner consisted of whatever fruits and vegetables I wanted to eat. My father's pattern for Saturday evenings consisted of filling an order for the Norocki's, the owner of the bar and grill. The rest of the evening was spent selling the remaining fruits & vegetables to the men in the bar to take home to their wives. My father said, "They feel guilty for being in a bar and would take home fruits and vegetables as a peace offering to their wives" like flowers or candy." He said that the remaining fruits and vegetables were his profit and if he did not sell them in the bar on Saturday night, they would spoil and we would lose that profit. I was never allowed in Hedges Bar & Grill. As the four evening hours at Hedge's passed, my father would occasionally come back to the truck, unlock it, and without a word, without my help, fill a peck basket with fruits and vegetables. When he returned to the truck to fill a peck basket, he was in a trance - wearied and troubled. He did not notice me. He did not speak to me. On this cold Saturday evening, this eleven-year-old boy felt a deep compassion for his father and the long hours he was working to provide for his family. Since my father returned to the truck only three or four times in four to five hours, I reasoned that it was a difficult job to sell fruits and vegetables to wayward husbands, even by a well liked salesman as good as my father. My 11-year-old heart went out to him. I wished I could hug him and more than that I wished he would acknowledge my presence and hug me. But he never did. I sat chilled with need. But he never did. My compassion for my father was mixed with a search for understanding. I wondered about my usefulness to him on the truck in the winter as well as the summer. From the time we arrived at the public market until the time we returned home, I was not needed 95% of the time. He performed all of the market functions. In the winter, farmer's helpers delivered the produce to the inside of his truck as they did for other hucksters who had no helpers. When my father was finished with buying produce, he would remove the delivered produce to the outside of the truck and organize the interior for the best possible showing to customers. All I did on these winter Saturdays from 5 AM to 8:30 AM, was sit next to a kerosene lamp to keep from freezing or, when he was organizing the truck, pass him fruits and vegetables — a task that I knew other hucksters did alone. I often wondered why my strong 39 year old father "needed" me. When he entered the public market restaurant for a hot breakfast, I wondered why he did not take me with him. At night, he spoke of bad behavior by men and women in Hedges Bar & Grill in the evening hours. I wondered if this was why he did not take me into Hedges Bar & Grill for a hot dinner. I wondered why it took him as long as 4 hours to sell the remaining fruits and vegetables to husbands in the bar while I waited in the back of the locked truck. I wondered if he would have kept me from school if there were no U.S. laws that made him send me. I thanked God for those laws. I wondered why he did not allow me to spend a nickel for a trolley ride home instead of locking me in the back of the truck for all those hours. I began to think of myself as a timid prisoner, afraid to speak up. The truck was my traveling prison. My father was my dominant warden. At age 11, at 10:30 PM on this particular Saturday night, in the solitary confinement of the back of the locked truck, sitting on an empty orange crate, huddled next to the kerosene lamp, I came to the realization that I was indeed, a "Prisoner of the Truck." I had to develop a plan to escape. The plan had to include my mother, confined in the crowded upper story flat in the inner city with my brothers and sisters, all of whom I loved so dearly. We arrived home around 11:00 PM. The children were sleeping. My patient and loving mother served us a hot meal. I welcomed the warmth of my bed, the time for Church and family on Sunday and the school week that kept me off the truck. I prayed that God would help me to find a way to escape. "I dedicate this book to my deceased mother whom I loved so dearly. She was goodness thoughout her 95 year life. Her example and her counsel helped me to strive for goodness in whatever endeavor I pursued.